Here's some shots of the MyTV screen. It’s curious that the blank movies on screenshot 1 have the Series indicator. And possibly that the non-blank Hangover Movies on screenshot 2 appear as Series also. Or is this explained by them all being in two parts round the News, or something similar? Roy as you suggest, they are split recordings, where they were interrupted by the showbiz news or some other rubbish on ITV2. Recordings from today/this evening that, I notice when entering MyTV, initially have no image - in these cases the image is typically there the next day and then persists long term. Perhaps the box is for some reason failing to source the image at the point the recording begins, and then after a smart standby overnight restart performs some recheck on wake up at which point it picks the missing images up. I'm seeing this on all 3 recordings my box has done this evening, no doubt the images will show tomorrow though as is usually the case for me. Recordings that initially have an image (or do the day after the above issue 1) but then at a later date no longer have the image. I have only one clear example at the moment: The Dragonslayer, Pick, 1/1/2018 6:30pm - 8:30pm. The image vanished about a week after the recording was made (one uncertainty with this example though is I did an MM2 yesterday so that could have been an added factor here). I have one other possible example: Ex Machina, Ch4+1, 25/11/2017, 10:02pm - 12:07pm. I am not 100% certain this originally had an image but I expect it did and then it vanished at some point since then. Very rarely tiles that never have an image. No certain examples at present. The oldest recording on the box goes back to early September and correctly still has an image on the tile. The younger members of the household have a series link recording set for The Simpsons (season 25 it seems) on Channel 4. Whilst they refuse to delete the series link they are rarely watching the recordings and the tile/folder now has 61 recordings in it. Of those 61 recordings, going back to early November, 31 do not have images. The ones that do/don't are spread throughout the time line (the most recent one without an image is from 2/1/2018, so from 8 days ago). Other than these 61 episodes of The Simpsons (of which 31 are currently missing tile images), the box has 45 other recordings (of which 3 fall into case 1 above and 2 into case 2). Were it not for The Simpsons recordings, and the day 1 of recording image issues, I would thus appear to be suffering about a 4% image loss, and that image loss would seem to occur some while after the initial recording, perhaps after a week or so (when perhaps some source of data is dropping off some YouView Cloud storage). Including The Simpsons in my overall stat (but not the 3 day 1 missing images which will likely clear by tomorrow) it seems I am missing images on about 31% of tiles! @Keith regards No.1, are you accessing MyTV directly via a harmony remote or similar? 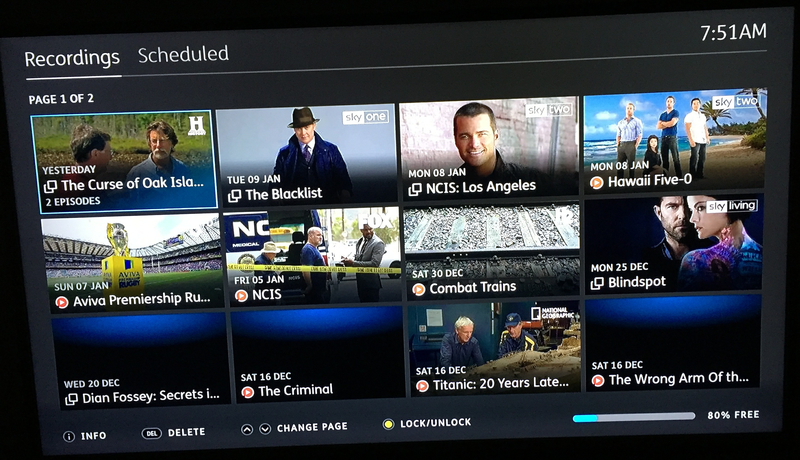 If so, what happens to those blank tiles when you access MyTV via the menu option? Do they suddenly populate with an image? Very insightful indeed! I am indeed using a harmony remote and hence always use the discrete code to jump straight into MyTV, and hence bypass the ribbon menu bar. Following your suggestion if I go in the slow way via the menu bar then I see the images for tonight's recordings in the menu bar first and then when I go fully into MyTV the blank tiles fill with an image almost instantly! Thats even more interesting.... thanks @Wayne & @Keith. Guardians of the Galaxy BBC1 HD, Mon 17 April 8.29pm to 10.20pm. A white BBC logo on a red background. Its the last one thats interesting. No film picture but it has a BBC logo on it. Why, I wonder? A rights issue or just a mistake? None of the films on this box show a series link logo, which is inconsistent with @PhilStations observations on his. All TV shows are fine and all have pictures on them. Yet more differing examples of missing image behaviour. 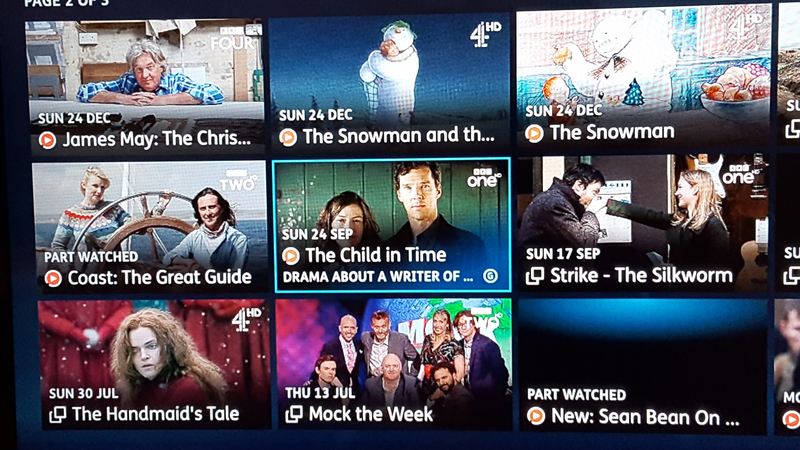 In defence of Youview is it any wonder they can't find a fix when there are a multitude of permutations re missing images or images missing then later appearing or indeed of images disappearing that were once there. In my case any missing images never appear. I wonder what Youview inadvertently introduced in their first real world drop of Next Gen software that was different to what testers were given as this behaviour has been happening since the switch from Old Gen to Next Gen. Obviously triallists were testing different patches than what Youview intended to plump for as their initial Next Gen drop. It might be of help to the development folks if there were any initial triallists around who might be able to point out how the test software was working in contrast to the initial and all following public Next Gen software in relation to Tiles/Images. There has to be a fix to be found somewhere, or it could be a case of Tiles being the wrong route to take, (although I'm happy with Tiles if only they worked properly), especially as reports are now beginning to surface of tile images beginning to play up in a similar fashion on the Freeview Play boxes (thankfully I use List view on mine). EDIT*** @PhilStation ; I've been checking with a friend who owns a T2100 (like myself) and his recording of The Hangover on Jan 1st also series linked BUT did produce tile images. As well as having some missing film tile images, he, like me, also has missing images for tv programmes. For me at least, regular TV shows (apart from Sarah Millican as stated) show images right back to my oldest recordings in August 2016. I am attaching two images of MyTV screen showing my blank tiles. 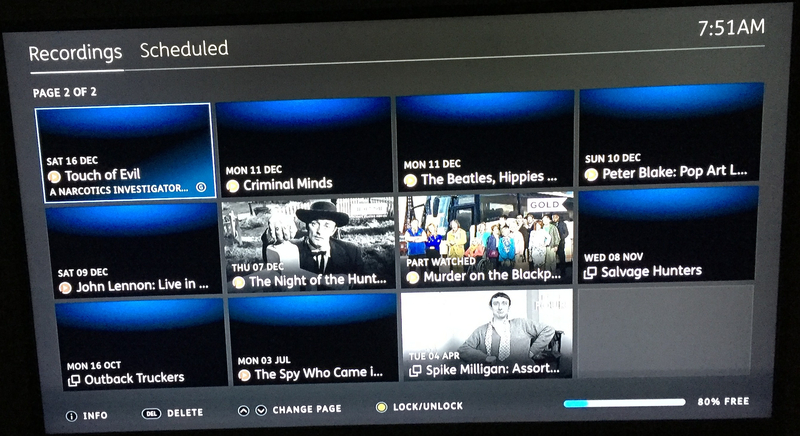 This shows blanks are from both films, programs, single episodes and series subscription channes and Freeview. Some interesting behaviour going on with the remotes, it'd be good to know how many people here are using the provided remote and how many are using alternatives such as the Harmony remote and are experiencing the issue. If there are others using the Harmony remote and use the code, try without and see if that works like @Keith's example. I use a Harmony remote but only have buttons mapped from my original remote. I don't use any 'special' coding to jump direct to any sections of the UI. Scheduled recording lacking a tile image: Sunday 14th 10pm CIHD "Britain's Forgotten Serial Killer". Saturday 13th 11pm Quest Red "An American Murder Mystery: Chandra Levy"
I can only imagine the difficulty of finding where the fault lies as a friend also has the Quest Red recording scheduled on his box and he has a tile image on his (he's on the same transmitter as me for Freeview). He, like me, doesn't have an image for the above CIHD recording. He has only ever used his supplied BT TV remote. EDIT**** The Quest Red programme now has an image on its tile. I was browsing my upcoming recordings just now and the image magically appeared. If there's any other recordings which lost their tile image just after they fall off the backwards EPG, please let us know with the programme name, channel and time. 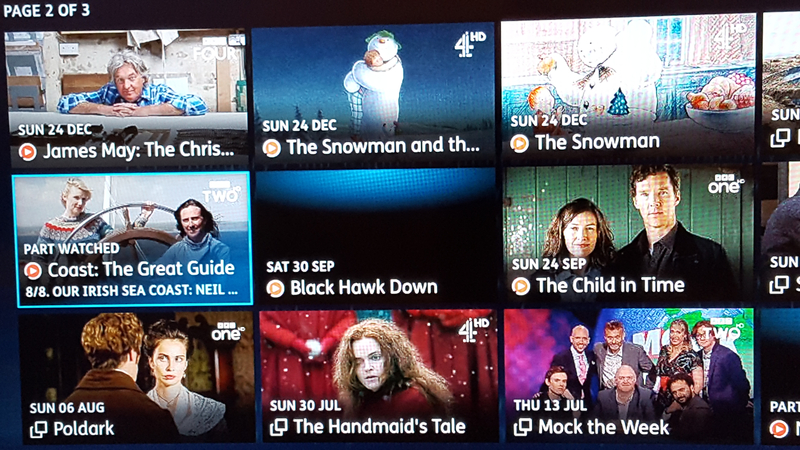 None of my programmes which DO have a tile image ever lose that image no matter how long they stay on my box. I've sometimes had recordings on there for months and the image is there the entire time. For the recordings which don't have an image when setting them up, unfortunately no image ever appears for them, again no matter how long they remain on my box. A recording has appeared on the MyTV Scheduled screen for a programme called "Mysteries of the Missing" on Discovery HD for Sunday 21st January @ 8pm, that's NINE days from today. It has appeared as a series link, has no image, and hasn't been scheduled by me. It was there when I turned my box on this morning. 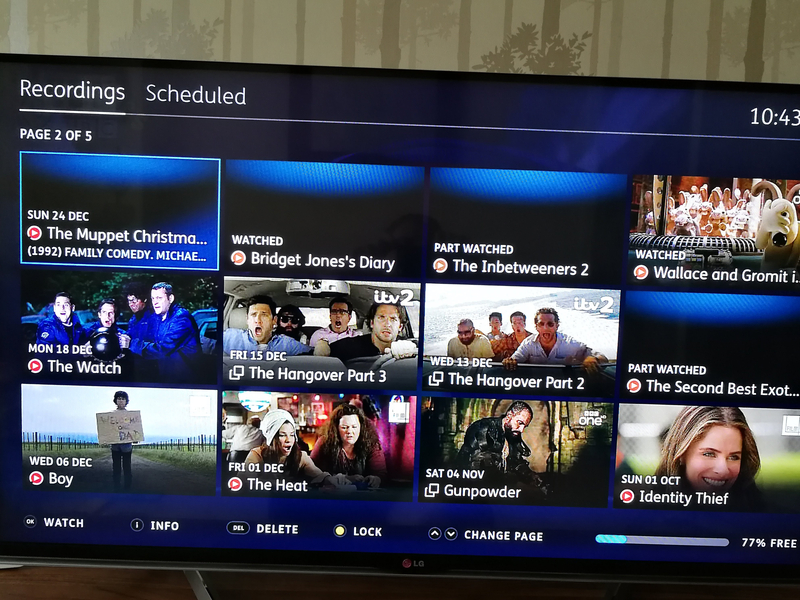 I only use my box to set recordings, I never use any of the apps (BT or Youview) to access my box, nor have I ever downloaded them for use at any time. Hi Robert, our content team are still looking into this one so will update you when we know more. I'll pass over your most recent example for them to take a look at! Something else I've noticed about tile images, they are all in SD only and look scuzzy and unprofessional. Thanks @PhilStation I thought I had tried this but obviously not! 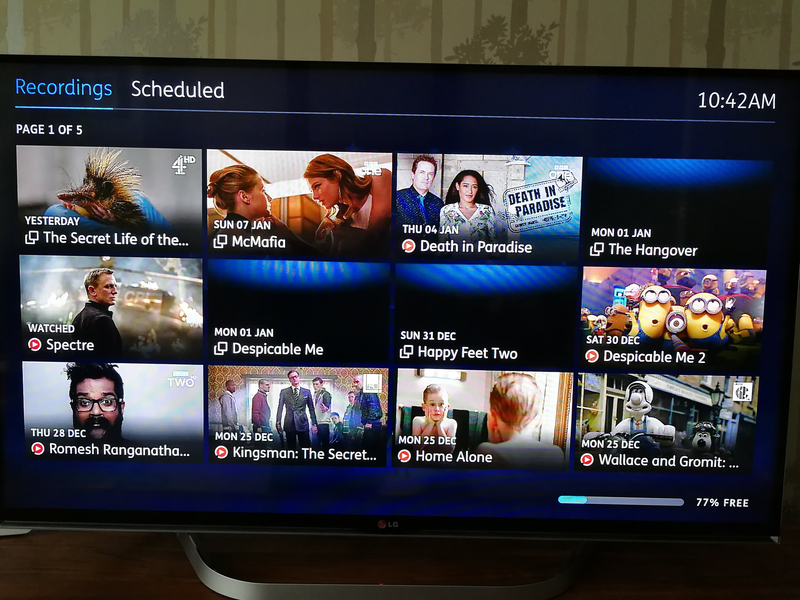 Some other interesting behaviour - if you have a tile without image and one next to it with an image, deleting the programme without the image moves the next tile left and this then loses its image - but it comes back if you switch pages or go out of MyTV and come back into it. I have also seen images disappearing and re-appearing periodically, but haven't noted which ones with any accuracy, I know Ex-Machina exhibited this but has now lost the image completely. See below: Black Hawk Down - No image. Then delete it and The Child in Time moves to that slot and loses its image. Change pages and The Child in Time regains its image. Two retail boxes, one using a Harmony remote and one the standard remote. Hi Robert, we have a bit of feedback on the most recent example you raised- 'Mysteries of the Missing' on Discovery HD. It does look like BT have not provided the image for this programme yet, so it's not an issue. Although we will keep an eye on this to make sure it does appear correctly. Some of the examples given are movies, there may be instances where the image rights are not available or provided by the broadcaster (this is not always the case). 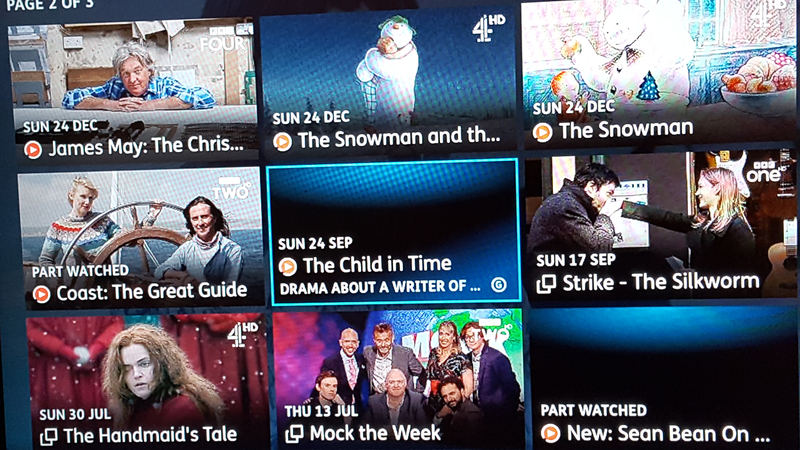 Looking at other shows mentioned it does look like there was an issue with the 'Muppet Christmas Carol' on Channel 4 HD where the image disappeared for this so I will raise this for investigation. In addition the issue raised by SomersetBob is a new one so will definitely look into this one! So effectively you're saying that it's NOT an issue because BT haven't made the tile image available (as yet). BT seem to decide that a lot of their programmes don't warrant an image, I'd call that a definite issue. Also, you say that if the image rights aren't available then no image can be used on the tile. Was this not though of before implementing tiles? Certainly makes Youviews decision to go with Tiles instead of keeping Lists (or at least giving the user the option to decide between them) look very stupid indeed. Why someone thought it would be a good idea to use Tiles knowing they could be blank depending on provider/rights is beyond me. Didn't they realise a hotch potch screen of empty tiles would just look plain amateurish at best? Hi Robert, it's probably more accurate to say in this instance it was not a bug for the image showing on 'Mysteries of the Missing' as it had not been provided. I agree however that if you are experience this on a significant amount of content then this does need investigating. I've never recorded The Muppet Christmas Carol nor had any problems with images disappearing. If I get an image, it stays until deletion of the recording itself, so no problems here re disappearing images. I'm at a loss as to how my issues can be related to the 'disappearing' images. Good luck getting to the bottom of this after all this time Philip (and team). This thread is titled ‘Blank Tiles’, and does not limit itself to one particular reason why tiles are blank; indeed as Phil reports above, there can be myriad reasons why tiles are blank. And each needs to be tracked down and, where possible, knocked on the head. Even if the only common factor is the absence of an image on a tile. Agreed @Roy. I'm not arguing any different. Philip made it appear, maybe just a badly worded reply, that the issues were somehow connected. I wouldn't expect a quick fix to this though as they've been investigating (at least I'd assume so) since Next Gen day 1 when the missing images problem was first reported by me and others. I'm still wondering what they changed from the final triallists software release to the actual finished product to trigger these problems as they obviously weren't present in testing otherwise it would have been flagged and sorted before release day. I'm noticing temporarily-vanishing tile images more and more. It's really minor in the grand scheme of things. As an example – I had the first three episodes of Marcella recorded, ITV HD. On entering the series folder, I didn’t notice anything amiss, although I tend to click through quite quickly. I watched the first episode then pressed stop/back (I can’t remember which sorry) at the end to return to the series folder. At this point, the show I’ve watched has lost its tile image, but the other two are still present. I delete the watched episode. The other two tiles slide across to positions 1 and 2 and both then lose their images. I’ve left the screen up for a good 5 minutes and they haven’t come back, although if I then back out of the folder and return to it, both show their images straight away. Internet speed shouldn’t be an issue, fairly solid 36-37mpbs and the box is connected directly to the router. It's a BT DTR-T2110 running 29.45.0... is it just me?